Although this movie doesn’t tend to be the kind of genre I usually watch, I was quite intrigued by the concept of this movie… by the trailer of it. I’ve seen a couple of different adaptions of the stories of Sherlock Holmes, but I found this one to be especially intriguing. I thought it was good to see Sherlock Holmes at the end of his career and suffering from ailments, even while still trying to hold onto his mind and remember the details of his last case. I felt Ian McKellan did a really good job of playing Sherlock Holmes and I felt he portrayed the character’s frustrations really well. It was also good to see the differences in the flashbacks to how Holmes was in the present day of the movie. It was interesting to see Sherlock Holmes caring for the bees. I’m not particularly fond of buzzing things at all… but I can tolerate bees far better than wasps. One of my favourite parts of this film was the relationship/friendship that built up between Holmes and Roger. I would have liked to see more of Roger’s relationship with his mother, but it was good to see him developing a closeness with Sherlock Holmes. I found the flashbacks to be really intriguing, both to the final case and to his trip to Japan. I thought it was good to see elements of the Japanese culture and I could definitely understand Holmes wanting to fix his memories. It was good to see something of his intellect still showing through even later on his life. 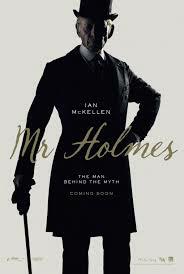 I was a bit disappointed not to see more of Holmes’ friendship with Watson and there were quite a few elements of this movie that made me a bit sad. I did think there was good use made of foreshadowing and I did definitely find this movie entertaining and engaging to watch. It’s not the sort of thing I normally enjoy, but I’m glad I chose to branch out.